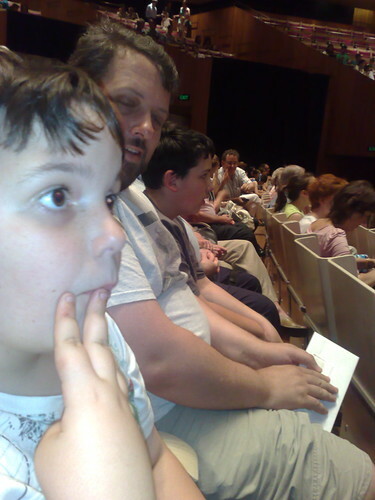 When Adam announced that he was buying tickets for us to take the kids to a performance of Handel’s Messiah at the Sydney Opera House the day after our Christmas party I was a little unsure of the wisdom of such an endeavour. At breakfast this morning, which we were eating at midday on account of Adam and I having gone to bed at 4am, Tom very nearly confirmed all my fears by greeting the news that we were off to the city with a massive attack of the grumps, but after I threatened dire consequences for bad behaviour and Adam promised mango smoothies as a reward for being cooperative he pulled his head in and stopped whinging. On Sunday the 13th of December at 2.00pm, we invite you and your whole family to The Beginner’s Guide to Messiah with an entertaining and informational performance of Messiah excerpts. Our Artistic Director Brett Weymark will guide you through the inspiration to the music with insights into the great master, Handel. It was fantastic! After the overture Tom leaned over to whisper in my ear “This is actually really good, I’m glad you brought us.” Brett Weymark, the conductor, did a fabulous job talking about Handel and the music, covering the history of the work and its performances during Handel’s life, anecdotes about Handel written by people who had met him, and discussion of the music itself. I think my favourite bit was Brett telling us to listen to the violins to hear how fast the angel’s wings were flapping during the bit where they visit the shepherds. It had just the right touch of humour to make it accessible to the kids and at 1.5 hours wasn’t too long. The kids would never have lasted through the 3 hours of a full performance of Messiah and I’m not sure I would have either! 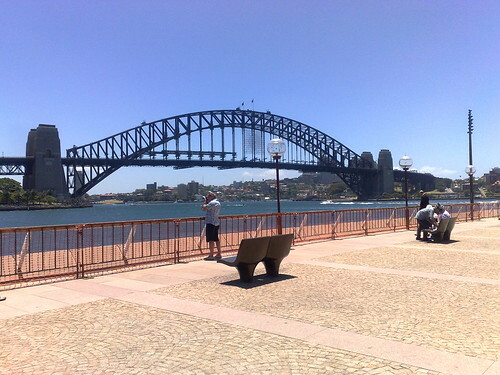 The Harbour Bridge as seen from the Opera House forecourt. 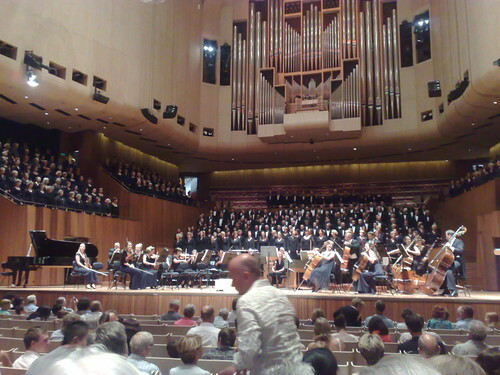 Inside the Concert Hall with the orchestra and 300-odd choristers. and on the other side, Caitlin. That's an amazing story of recovery and family resilience! Thanks for the party too! Awesome night. Jealous! Is it something they do every year? Darn I wish I'd known about it! I'd not heard of it being done before, but then we've really only started to pay attention to what's on in this line of things in the last year or so. I love that you did that! What a special adventure. So perfect for this Holiday season! And I am SO totally jealous of your warm weather! It is totally brrrrrrrrrrrrrrr brrrrrrrrrrrrrrrrr freezing here in Pennsylvania! Your kids are adorable! I am glad they had a good time! How fantastic! I got to sing with a choral group one year… and it made The Messiah part of my holiday tradition. I've not found a group lately where I can go and enjoy the performance but I listen almost daily on my headset at work! Sounds like you got to enjoy a really special day with the family! would love to do that with mine when they get older! 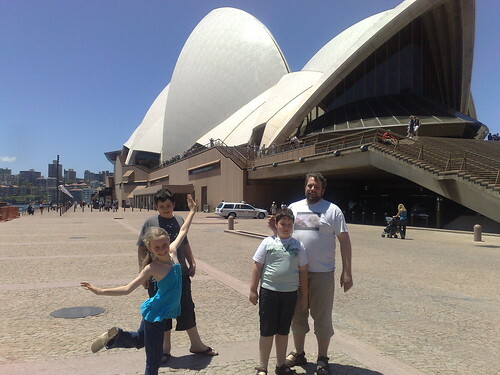 For all the pictures I've seen of the Sydney Opera House, I've never seen any of the interior. How very cool. What a lovely day. I think that would be a great way to spend a Sunday. Such beautiful photos!! I'd love to go to something like that myself! Have a wonderful week! These are beautiful pictures, and it's the first time I've seen the inside of the opera house. Thank you for the visit. Gorgeous Opera House! Love your pictures! Beautiful! And love the photo in your header!! How cool. 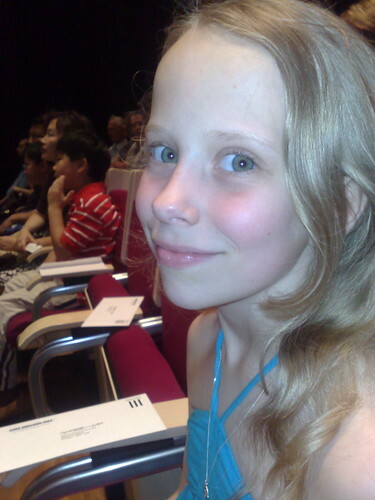 Even to this day I go to see the Messiah with my Dad (Mum hates sitting through it). I would love to take my kids to a cut down version. Very cool! Thanks for sharing your SUnday with us! What a great day! The kids look like they are having a great time! That was wonderful and your family is beyond lovely! Oh that brings back memories….sounds like a wonderful time….now you've made me homesick all over again. I just mentioned in my 25 you don't need to know that I sang in that very hall…and that was well over 25 years ago! It looks like such a special day! I am so glad you could go on that adventure : ) Hope your new year is happy!